Since VENOM debuted with “Welcome to Hell” back in 1981, they have established a certain level of notoriety that made the parents keep a close watch to what their children are listening to. Only a year after that, they have released “Black Metal” which aligned them with the biggest names in the flourishing age of metal in UK. The said album also gave birth to a more revolutionary genre named after it. 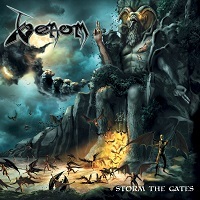 After 36 years and a total of 14 albums, VENOM releases “Storm the Gates” at the closing end of 2018. This was more than a year since the release of their rivaled twin VENOM INC.’s “Ave”. If you are a fan of VENOM since the beginning who’ve been hooked and addicted to their fast, loud and aggressive sound, this 13 track record might not please you that much. Although made particularly to sound raw and primitive, it has certain elements that are too poor to not notice. Their punk and underground mentality is still there as they barely made any computerized modification to the album’s sound, and that can be observed in the entirety of the album. However, the production is a major issue here. First and foremost is how Cronos’ vocals seem to be swimming in the middle of nowhere. This issue of the mix can be observed largely in the songs “Notorious”, “Destroyer” and “Storm the Gates”. Every instrument is properly layered in the mix until the vocals comes in as if Cronos was actually singing outside the recording room. Other than the issue in the mix, I also noticed that majority (if not all) of Rage’s riffs are rather generic and overused. No unique and riff was crafted, and if there’s so, it was really boring and not engaging. Meanwhile, Dante did a good job on the drums marching through mid-paced and fast-paced attacks. Some of his notable parts was in the song “Over My Dead Body” and “I, Darklord” where he played on an all-out assault and executed with authority. While some might find the entire album a lazy and unentertaining one, I would say otherwise. The album has its share of epic moments in “Over My Dead Body” and the first track “Bring out Your Dead” with its energetic approach and catchy tunes. On the flip side was the title track, which I have expected to stand out but rather found its self falling over the precipice of the void. Summing up this review, I’d say “Storm the Gates” is not so fun but nonetheless is a fair release. You would notice that VENOM’s brand of music is not that big in this album. Cronos’ voice still has it, but it’s not enough to carry the weight of the whole album. The album also lacked the intensity and overall aggression that they used to have. This is a really bitter pill to swallow, but I can say that after nearly four decades in the industry, VENOM is now fighting the battle to remain relevant and it doesn’t sound good. And while “Storm the Gates” is still enjoyable, this might also be the signal that VENOM is one step closer to bringing down their banner. Lastly, for the sake of argument and/or comparison, “Storm the Gates” is way too inferior compared to their rival twin VENOM INC.’s release “Ave”.